How many times a year when weeding the garden, or planting or thinning out your plants, do you wish the ground was not so low? Ash Green raised beds are ideal for putting back the enjoyment in gardening, either for growing vegetables or flowers. Raised bed gardening gives better results all round. From the time they are installed, you have total control of what happens in your garden. You choose what soil you want to use for your plants (ideal for acid loving plants in an alkaline environment), soil can be easily changed if a virus is accidentally introduced and overall gardening becomes a joy. Because they are tended from the side, there is no soil compaction and are ideal for a “no dig” system of cultivation. Ideal for hardstanding or paved areas. Ash Green raised beds come in a wide variety of sizes to suit all gardens, from the smallest patio for a few herbs to large allotments. We are happy to work with you to decide what is best for your particular needs and our made to measure raised beds can even go around corners or straddle terraces if this is how your garden is shaped. Each bed is lovingly handmade in our workshop, assembled to ensure an exact fit, part disassembled and delivered to your door with simple instructions for reassembly in minutes. All you need is a screwdriver or screw-drill. All of our wood comes from managed sustainable forests in Cornwall, Devon and the Isle of Wight. 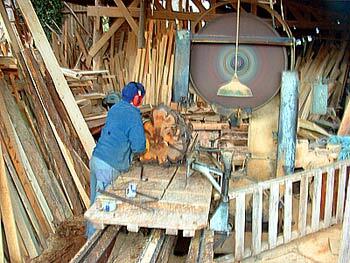 We do not use wood from abroad. We use larch, macrocarpa or Douglas fir, all durable wood. Wood can be treated or untreated to suit. We guarantee our products for up to six years*. 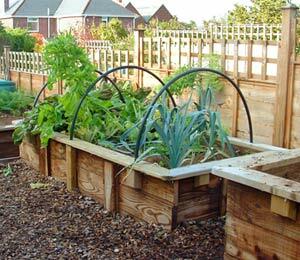 *Six year guarantee is for raised-beds or planters used as garden beds in reasonable conditions. It does not cover raised-beds left in standing water or used for purposes other than gardening (ie storage of hazardous material) or any that may come into contact with excessively high temperatures. Poly Pipe hoops (optional extra) made from recycled plastic. Fleece covers (optional extra) made from heavy duty Envirofleece 60, a strong, heavy weight fleece for winter protection. All other accessories made from recycled material where possible.